Once upon a time there was a teenager who needed to find his first job. He was just past sixteen, and had struck a deal with parents that involved some cash on his part in exchange for driving privileges. But he, being sixteen, didn't know the first thing about getting job. And both his mom and dad realized this. So late one night in their bed, mom asked dad, "Are you going to give Richie any help with finding a job?" Dad was prepared for this. "Yes I am. I think this is a great learning opportunity for him. I'd like to help him in a way that will teach him how to make wise decisions on his own. He'll need to learn how to do that soon, you know." Mom pulled closer to her husband and rested her head on his chest with a deep "Mmmmm". "Here's what I have in mind", dad said, encouraged by her touch. "I really want him to work at Agway loading feed. Denny needs some help down there, and Richie would really enjoy it. So that's what he needs to do. If he picks something else, I'm going to be angry with him, take away the driving privileges that we agreed upon, and probably not speak to him until he quits. This is still my house, and although he is sixteen, he's got to obey my rules. "But here's what I want you to do. If he comes to ask your opinion about it, don't tell him anything. He'll be wondering if it's a good idea to just pick something he likes: let him wonder. He'll probably be thinking that he could cause himself some real problems by picking the wrong place to work: let him think that. He'll be sure that we have a strong opinion about this (which we do), and he'll want to know it. Don't give in: let him wonder and worry and try to figure it out on his own. We need to make this as hard for him to figure out as we can. If he seems like he's going to screw it up and pick something else, don't warn him in anyway. We'll let him know that he chose wrong after the fact, believe you me. "I really think this can be a great opportunity to let him try and make decisions on his own, a wise lesson he'll carry with him for a long time." That night, Richie thought for a long time about his decision, and decided the best thing to do would be to ask his dad's opinion over breakfast. But he forgot altogether about asking when he came down early and found his dad still sleeping on the sofa. Perhaps you've taken the opportunity this summer to catch a baseball game or two. If that's the case, and you're relatively new to the sport, Bill Simmons has a useful primer on one of the game's best features: the Baseball Brawl. I had a fun camping trip last night in celebration of a day off work, and this morning I did some hiking and four-wheeling around the Quehanna Wild Area. I wanted to see some new birds, and I got a few. I got pictures of these two, but they just weren't blog quality, so I stole these from usgs.gov. 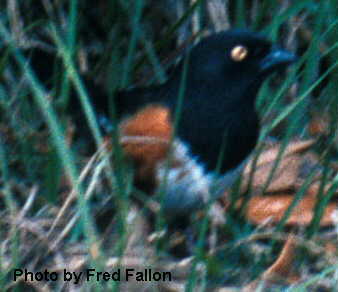 The first is a very common mountain bird, the Eastern Towhee. This bird is very common along the edges of the forest, so if you ride down the dirts roads in the summer you're very likely to see their distinctive black and white tails flying away from your car. I believe that these are sometimes referred to as the Roufus-Sided Towhee because of the patches under their wings. I got close enough to see a pair: the one you see here is a male. The female has a browner head. The song is distinctive as well: click here for a sample (thanks again USGS). The other new bird I saw was a Yellow Throated Vireo. 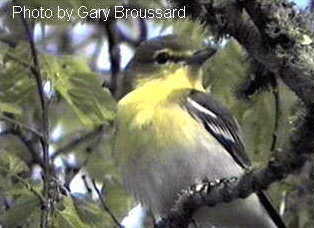 I'd never seen a vireo before, although I'd heard them many times- probably every trip to the forest. They are noisy singers, but reclusive treetop birds. For some reason, one of these little yellow guys was down in the mountain laurel today long enough to be observed in the binoculars. I was also able to use my bird song CD and the USGS website to identify two other bird songs, although I couldn't see either of the birds on this trip. The first was the Whippoorwill, an enthusiastic caller that comes out during the night. The other is another reclusive tree top caller with a very distinctive sound, the Veery. Click on the name to hear a sound sample.